My obsession with fish started at 5 years old, smashing snails for bait for my hand line off the wharf in Mackerel Cove, Bailey Island, Maine. The mackerel could be thick at times, once transporting my plentiful catch back to the cottage wrapped up in my sweatshirt. This led to bass fishing as a youngster in the pond at the end of my cousins street in Putnam Valley, NY. And catching “sunnies” in the Raritan River in my home state of New Jersey. 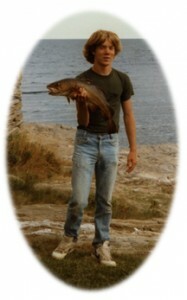 I moved to Maine at the age of 18 where my love for the striped bass took hold. I then made my way out to Seattle and tried my hand at steelhead. A noble species indeed! Taking a break from Seattle, I tried out the bluefish runs on Nantucket island, true slammers! A few years later I found myself in South Walton County Florida. Florida is where the fishing obsession burned like wild fire. I got my first fly rod, circa ’92. My love for the speckled trout flourished and I have been stalking them up to this writing. I started tying very rudimentary flies to match the finger mullet that the trout and redfish love so. Since then I have caught dozens of species on fly. I am a purist in thought and action so until very recently have not owned a conventional rod. Even so I had to scour the Internet for a 60’s Lamiglas spinning rod matched with an early 70’s Mitchell 300, who remembers those?! I have retired from my 33-year chef career, including 20-year restaurant partner and founding chef of Vintij, and in the winter of ’15 I got my captain’s license. My beautifully restored 16′ creek craft skiff is outfitted specifically for your fly fishing dreams to come true. If you’ve wanted to try fly fishing but felt intimidated, I’m your guide. I will work with you until you are proficient in casting. I will be patient and work hard for your first catch. As Curt Gowdy used to say…tight lines!